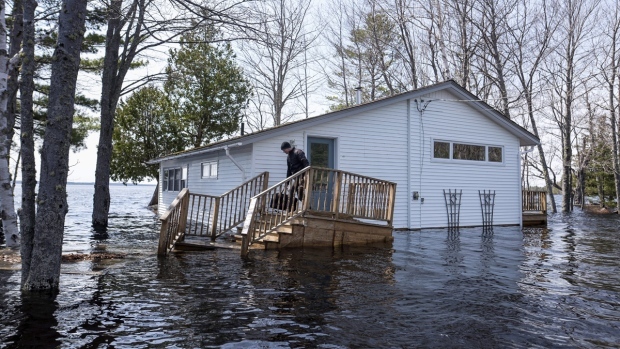 New Brunswick's record-breaking floods are a jarring reminder climate change is bringing a watery future that will wash away old patterns of life and force many to higher ground permanently, say environmental scientists and hydrologists. "The reality is that people expect the world to be the way it was, but it's not," said Louise Comeau, a professor at the University of New Brunswick and member of a national panel on climate change adaptation. When the waters recede, the provincial and federal governments must frankly inform homeowners the future holds more of the same, says hydrologist John Pomeroy, director of the global water futures program at the University of Saskatchewan. "Sometimes people, when they've been flooded out, it's a good time to offer to buy them out and remove the homes from the dangerous location," Pomeroy said in an interview. New Brunswick is suffering through record flooding, with rising waters forcing the closure of the Trans-Canada Highway between Moncton and Fredericton and many people being forced out of their homes. "The floods look like they're getting larger," said Pomeroy, who is working on a fresh models for mapping future floods, in tandem with a network of university scientists studying the nation's largest rivers. The hydrologist says the public needs to understand historical levels of water flow are no longer guides to the future. Sudden temperature flips from frigid April snowstorms to 26 C, as occurred during the spring runoffs in parts of New Brunswick, are a feature of climate change that encourage flooding, he said. The province's legislative committee on climate change cited computer models predicting that by 2100, New Brunswick's mean annual temperature will increase by as much as 5 C, while more intense rain and snow will increase the amount of moisture hitting the ground. 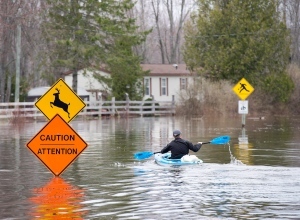 Those trends aren't the sole causes of river flooding, but higher seasonal temperatures and precipitation increase the risks, says Al Pietroniro, a senior hydrologist with Environment Canada. "Across the country there's an acceleration of what we call the water cycle, which means because the atmosphere is warming, we're seeing increased precipitation," he said in a telephone interview. Premier Brian Gallant told a briefing last week that it's clear the increasing frequency and severity of severe weather events can be traced to climate change, and the government needs to become more proactive. "We have to do everything we can to combat climate change. We have to do everything we can to mitigate versus climate change, we have to do everything we can to raise awareness about climate change," he said. "We have to do a better job of mapping where there are flood zones, where there will be the potential for flood zones in the future, where there will be erosion, what can be done to protect our coasts and to protect our communities." Comeau, who has authored studies on the impact of climate change in her province, says she suspects that floods once expected every 30 years are now more likely to be "once every five years or even every two to three years." Every region of New Brunswick now has flooding stories to share describing dislocation and disruption, she says. In addition, an ice storm on the Acadian Peninsula in January 2017 caused power, communication and transportation disruptions. Perth-Andover and the Tobique First Nation have experienced multiple flood events, including the province's most costly event at $25-million in March 2012. The province provided $8 million to cover the cost of relocation and flood-proofing of low-lying homes, with approximately 80 homes that were damaged, either demolished or relocated, as well as road and downtown changes to infrastructure. In 2014, in response to recurring flood events, the province released a flood risk strategy, noting that from 2008 to 2014, the province experienced a "three-fold increase in disaster relief assistance programs triggered by flooding," and $100-million in direct costs to the province, estimated to be half of total costs. Blair Feltmate, the head of the Intact Centre on Climate Adaptation at the University of Waterloo, says that "New Brunswick has an attitude of management by disaster." "New Brunswick seems to rush to address risk when it's happening, and then, after the event subsides, the province relaxes and waits for its next disaster." Jason Thistlethwaite, an assistant professor at the University of Waterloo's faculty of the environment, said in an interview part of the problem is that municipalities set zoning regulations and collect property tax revenue but it's Ottawa that is paying the lion's share of disaster relief. "It's good to produce the information (flood plain maps), but ultimately it's hard for a municipality to impose development requirements when their primary source of revenue is property taxes from new development," he said. The province must move more quickly to create a common set of standards on new development for all towns and cities to obey, he said. The federal government must also refine its approach, he argues, tying disaster relief funding to requirements that homeowners move out of areas doomed to see repeated floods. The province has entered into agreements with Public Safety Canada to update and modernize existing inland flood maps by 2020 and coastal maps by 2019, said a spokeswoman for the Environment Department. Officials from the provincial departments of Environment and Justice were otherwise unavailable to comment on the government's implementation of its climate change action plans, which were announced by the Liberals with fanfare on Dec. 7, 2016. Mike O'Brien, the mayor of Fredericton, says his city has been a leader in adapting infrastructure for climate change, with storm water systems upgraded and some key intersections raised. New apartment complexes along Queen Street, not far from the high point of the latest floods, were approved several years ago, but the mayor said "Buildings constructed on the periphery of the flood plain are designed to handle it ... but looking forward and 50 years down the road, what different regulations will have to be considered? We'd love to be part of that discussion." Comeau says the provincial government has taken steps, such as improving mapping available to the public, and has been moving towards giving municipalities clearer guidelines on zoning rules in flood plains. Cities are hiring teams to work on flood adaptation, she says. But she also says people who live near the province's 60,000 lakes and 2,500 lakes and ponds must buy into the science of climate change, and the tough discussion on moving out of flood plains needs to start immediately. "Often when the infrastructure decisions are being made, the community wants the ice rink fixed rather than the water pipes enlarged," she says. She says she's hopeful the latest disaster may start to shift citizens' attention onto what lies ahead, even as they bail out and cope with the latest round of damage. "You have to have a conversation about the reality," she said.